The craze for good health and healthy living has spurred the use of saunas at homes and has this has been encouraged by the availability of sauna kits. More and more people are turning to this amazing health regimen that has the most potent effects in refreshing tired minds and exhausted muscles. When the body gets exposed to heat and steam, the pores of the skin open up so as to allow the sweat to escape. The body temperature also rises thereby inducing a natural fever and the two phenomenon work at tandem getting the body rid of toxins, increasing blood circulation, rejuvenating muscles that are under stress, refreshing the skin and providing relief from body aches and pains. The immune system of the body also gets a boost after a sauna bath. It is not for nothing that the Finns consider the sauna to be a pharmacy for the poor man. Setting up a sauna at home is the best way to derive its multiple health benefits. After a tiring day out you can simply walk into the sauna, get refreshed and then jump into bed only to wake up fully charged the next morning. Having the sauna at home gives you the scope of using it even when you are hard pressed for time as you need not run outdoors to find a sauna room of your choice. 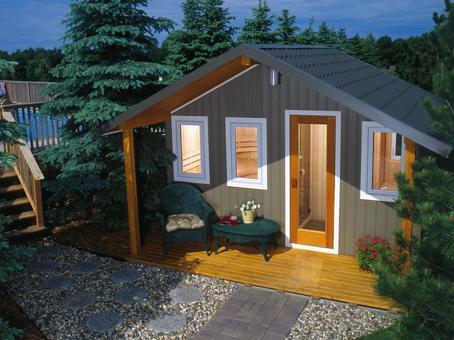 Sauna rooms are now available in knocked down conditions and is known as sauna kits. The availability of these kits has made it very easy to construct sauna rooms at home and it encourages you to do it on your own, which is not difficult at all. Everything that is required for setting up a sauna room is included in the sauna kits. All you have to do is to describe the design and size of the sauna room that you want and the manufacturer will get it done for you and supply the parts in knocked down condition. The entire lumber structure that is required for setting up the room including the bench to sit upon together with hardware and accessories of all types including fasteners and nails are all included in the kit. If you want to pick up any of the readymade sauna rooms from the standard range of the manufacturers then also you can get the kits for it. This is best left to the manufacturers who can guide you in selecting the type of wood that matches with the style and design that you have in mind. There are Poplar, Hemlock and Western red Cedar wood that you can choose from but ensure that these are kiln dried. Know about the aesthetics and individual properties of the wood before you finalize selection. Having selected the wood, there are other aspects that have to be considered. What kind of heating system you prefer, what would be the electrical requirements or do you prefer a gas fired heater, what kind of insulation and framing you like should all be decided before installation.